These will get any job done. When looking for a good pair of kitchen scissors you want to look for several things. First of all, you want super sharp kitchen scissors that will stay sharp and last a long time. In addition, you want to look for a micro-serrated blade on one side of the scissors as this will help the scissors hold on to slippery meat such as poultry. You also want a handle that is easily held and manipulated as well as shears that are a cinch to clean thoroughly. Shears that are high in quality are a must to have in the kitchen. Here is a list of four top quality shears to choose from for super sharp kitchen scissors that will get the job done in your kitchen. SOXO Good Grips Kitchen and Herb hears – These scissors are good and sharp and have several other desirable qualities. The micro-serrated blades come apart easily for cleaning. They also have two sizes of herb strippers for removing herbs from the stems. They are made of hardened stainless steel which allows them to stay sharp and cut through even chicken bones. As for comfort, they have roomy handles that provide a cushioned support for good gripping action. At around $18, they are priced right for those on a budget. As a plus, the OXO Good Grips Kitchen and Herb Shears also come with a guarantee and warranty. Kai Kitchen Shears – At around $20, the Kai Kitchen Shears are still in the budget friendly range. Made of sharp stainless steel, these scissors can accomplish almost any kitchen task from cutting pastry dough to cutting up a chicken. With a micro-serrated blade and easily separated bladed for cleaning, this is also a great choice for sharp, dependable kitchen scissors. However, this brand does not come with a warranty. Wusthof 8” Come-apart Kitchen Shears – These scissors are a great value for your money. At around $22, these scissors have much to recommend them. They are very sharp and will cut through even the most difficult, sticky poultry while still maintaining their sharp edge. The Wusthof 8” Come-apart Kitchen Shears are easily separated for thorough cleaning and easily taken apart for regular honing or sharpening. With symmetric blades this model is easily manipulated by both right and left handed users. 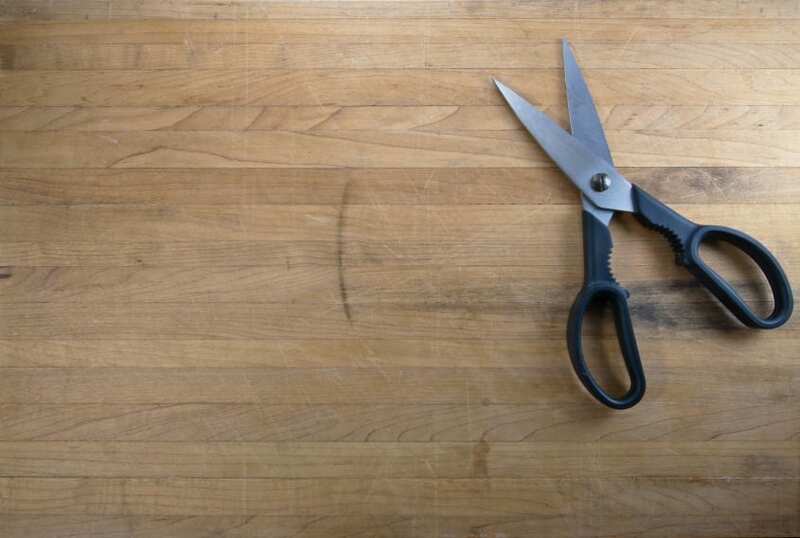 While dishwasher safe, some still recommend hand washing for these versatile scissors. Henckles Twinshear Kitchen Shears – While these scissors are pricey at around $40, they will last a very long time and rarely, if ever, need to be sharpened. They also come with a life-time warranty which is worth the little extra in price. Henckles Twinshear Kitchen Shears are great for all your kitchen tasks and are made high-carbon stainless steel. They need to be hand washed and can be easily taken apart for cleaning. They do not open as some other models; you actually have to unscrew them to take them apart, but this is not difficult. These four super sharp kitchen scissors are your best choices when looking to purchase this important and useful kitchen item.